Pi Day, or March 14 (3.14) is another arbitrary holiday that gives me the excuse I need to eat unecessary sweets. Have I mentioned I love Pi Day? However, most years I don't realize it's happening until the end of the day. I pop onto social media, reach for a box of cookies, and scroll through gorgeous photos of individuals far savvier than I enjoying glutinously delightful slices. Co-working with a friend who was clearly savvier than I, we finished our lunch and went to head home, she brightly exclaimed, let's get something sweet! "Have you been to Magpies Bakery yet?" I'm still rather new to Knoxville and though I'd driven by Magpies on the main drag (Central St) multiple times, I'd yet to stop in for a treat. She says, "You're going to love it, let's go."" Eclectic, hectic, and absolutely perfect. When we walked up, Magpies was at the mercy of a massive and disruptive construction project causing enough ruckus to burst an eardrum. That didn't stop the inside of Magpies to be bright and full of life! Funky mismatched decor, vibrant patterns, and a smattering of local ephemera are tacked on walls, stacked on surfaces, and available to entertain the eye at every turn. and other sassy baking-oriented remarks are printed on tee shirts and printed on cards for sale. Even with the racket going on outside, inside was a haven for sugar-lovers and anyone in need of a chuckle. The amount of options was nearly paralyzing, and that was before I discovered samples. They had cookie crumbles in cups, tiny cake slices in a dish, and a case full of micro-cupcakes for free sampling. I did a quick pinch to make sure I hadn't died and ascended. I sampled an incredible chocolate cake slice and followed-up with a chocolate Guiness cake with cream cheese icing. All this cake was threatening my fulfillment of Pi Day! After that last tiny cupcake, I got serious about my choices. Because it was Pi Day, Magpies went all out beyond their expansive cake menu and offered slices, mini-pies, and full pies in a variety of flavorites. <-- I actually wrote that word, almost edited it to "flavors," then left it because how Freudian and perfect, right? I can't say I'm familiar with Grasshopper Pie but the bakeress behind the counter assured me it's a Southern staple. 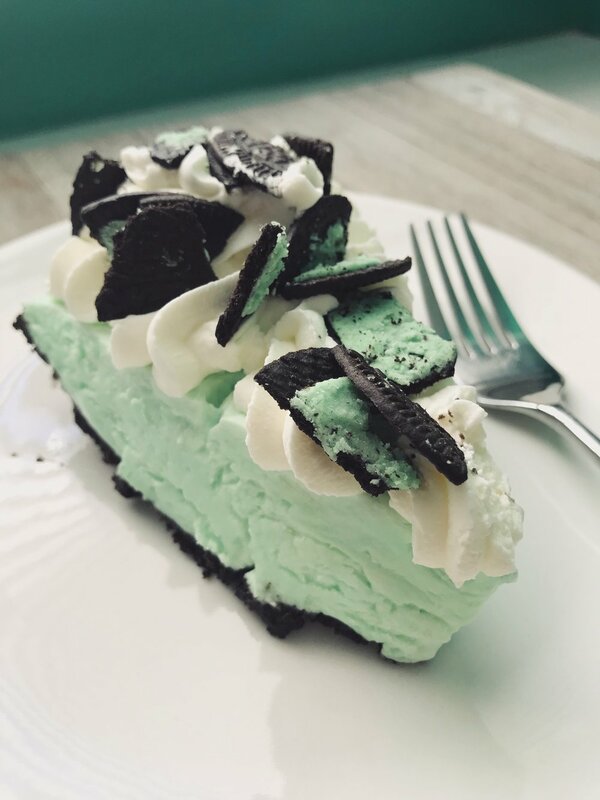 All I knew when I purchased it was that it was a mint-creme marshmallow-textured pie with Oreo crust, Oreo crumbles, and a light whipped cream topping. Anyone else out there love "airy" textured foods? This pie was spectacular. My friend and I brought our treats home, brewed our second French press of the day, and had strong coffee with snacks for the rest of the afternoon. I'm on a bit of a pie kick... what's your favorite type of pie? Share with me in the comments and give me a wonderful reason to eat all the treats in the coming weeks! 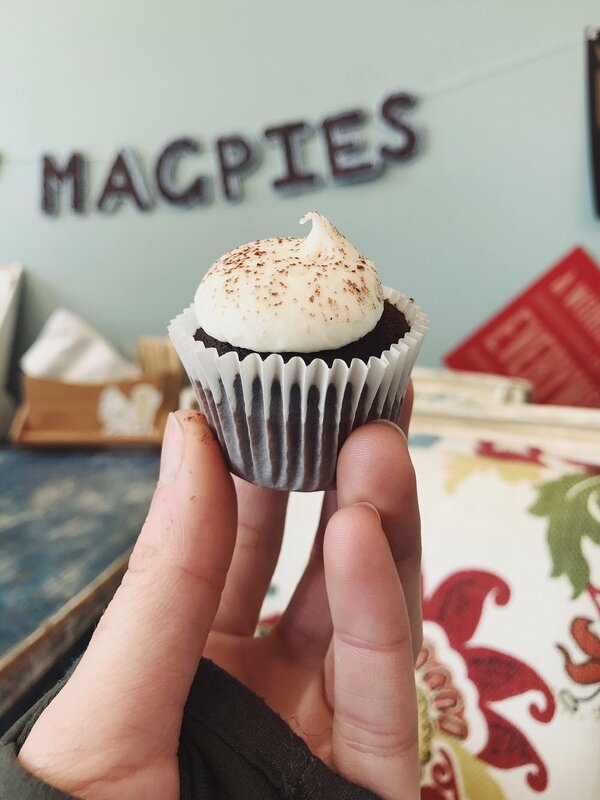 Check out Magpies Bakery next time your in Knoxville, TN.